We are pleased to announce that the scheme will be inviting both staff and students to submit project ideas in early 2019, to be considered for funding by the scheme. The IT Innovation Challenges scheme supports innovative ideas that can be developed into digital projects and bring benefit to the University or enhance the staff or student experience. 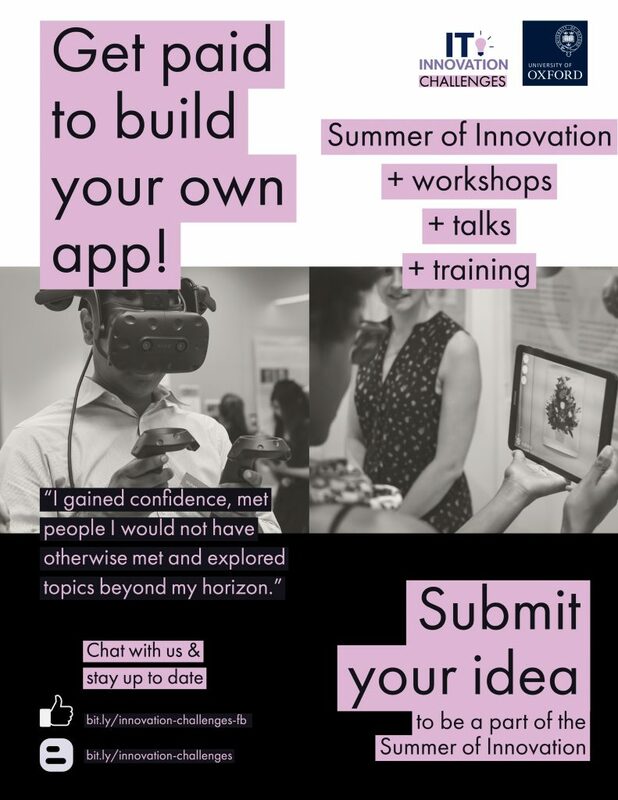 This year we are introducing the Summer of Innovation for students. Students are invited to share their innovative ideas and, if selected, go on to realise these as digital projects with support from the scheme. Being part of the Summer of Innovation will be similar to doing a paid internship, and students will be offered training and guidance to gain project management and digital skills and realise their idea. While the staff round will retain the format from previous years, there will be a new platform for ideas submission. This platform provides the space for discussions and unprecedented collaboration, thereby encouraging cross-institutional innovation. For regular updates, visit the IT Innovation Challenges Facebook page and come back to our blog. The IT Innovation Challenges is funded by the University’s IT Capital Plan and administered by IT Services.